Quotes like this one by Bertha Allen, speaking on behalf of the Elders’ Society at a 1999 Inuvik public forum on health and social services, capture the unrelenting passion and humor of this much-respected leader. After years of social activism in the north, Allen lost her fight with cancer and passed away on May 7, 2010 at the age of 76. 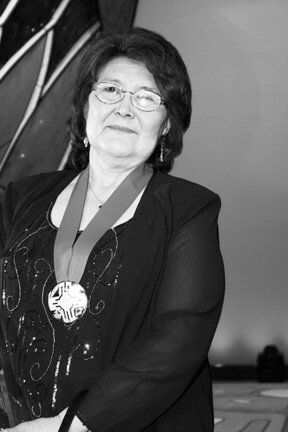 In her younger years, when the federal government “decided it was time to discover the Northwest Territories and civilize nomadic people” Allen was determined to see her Gwich’in people keep up with the fast-paced development of the day, recalled Cece Hodgson-McCauley, founding chief of the Inuvik Dene Band. Writing in the Inuvik Drum, Hodgson-McCauley noted Allen spent her whole life helping women, from teaching them to use vacuum cleaners and washing machines in a government job in the late 1950s to being president of the Native Women’s Association of Canada. Allen created the Native Women’s Association of the Northwest Territories in 1978 and committed to unifying and educating people. She also opened women’s training centres in Inuvik and Yellowknife. "I come from a long line of leaders,” she once said. “I was raised by my grandparents, and my grandfather was a traditional chief. It was instilled in me as a young woman that I was to take that role on." Being involved at the local and national levels wasn’t an easy job and “she did most of the legwork herself,” Hodgson-McCauley pointed out. Born in Old Crow, Yukon in 1934. Allen said that life in Old Crow was very traditional. It was an isolated community like many of the places where Aboriginal people live. "Very seldom did you ever see a plane come in. Most times the only visitors we had were our relatives from Alaska that came by the river, usually in the summertime when they could travel by water. "We had RCMP back as far as I can remember ... and their planes would come in occasionally." Allen later moved to the Mackenzie Delta area and made her mark there. She married her husband, Victor, and raised seven children. Her heart suffered a massive blow with the tragic loss of Victor in 2008, along with her daughter, Delma, and granddaughter, Asta. At Bertha’s funeral, daughter Donna Kisoun said her mother worked diligently for women without the luxury of a generous salary and raised her family without help. “I shared my mother with you, and together we are reaping the rewards of her dedication,” she told the congregation. Despite her busy public life, Allen was happiest in her home surrounded by family, cooking fish or caribou in her backyard, or sleeping in a tent out on the land. Displaying old-time frugality and ingenuity, Allen often harangued her great-grandchildren when they complained about being bored. According to Kisoun, her mother would tell them when she was a little girl she didn’t have any toys and made dolls by wrapping a piece of cloth around a rock to amuse herself. She wanted them to keep things simple and not be wasteful, Kisoun said. In a touching gesture, Allen’s great-grandchildren handcrafted their own toys the week after her death and placed them in her coffin to show their appreciation of her. Aside from her work with Aboriginal women’s groups, Allen was also part of the mainstream push for northern women’s political equality, sitting on several advisory commissions to the RCMP, and was the only woman on the Bourque Commission, helping to create a new constitution for the western N.W.T. In another capacity altogether, as a talented seamstress, Allen inspired women to have confidence in their handiwork. For her contribution to advancing social change on behalf of her people and northern women, Allen received many honors. Most prominently, she received the National Aboriginal Foundation’s Lifetime Achievement Award in 2005. In 2007, she was named to the Order of Canada, and in 2009 she was awarded the Northern Medal by Governor General Michaële Jean for her leadership. As she aged, health and social services took up more and more of Allen’s time and she volunteered on two medical boards. In 2003 she saw the completion of the Inuvik regional hospital and was invited to speak at the official opening. Reminiscing about the early days of health care, she told a story about Aklavik men wrapping up a young mother in a blanket, putting her on a toboggan and then running as fast as they could to get her to the hospital. With trademark humor she confided she had already made plans to move into the hospital’s long-term care unit. “I already know which room I would like … and it’s certainly not the room that’s facing the graveyard,” she quipped.